I’m not so much worried about the pothole for our vehicle, but I have nightmares about a top-heavy brown truck overturned at the bottom of the hill. Somehow, I don’t think Amazon Prime free shipping covers that kind of damage. Which brings me to my current game. I log on to my computer every morning to track where various packages are en route to my front door. And this is what I saw this morning. My package made better than expected time last week and arrived in Wichita on Dec. 5. This is where the problem begins. Instead of my friendly UPS man delivering to my door, they transferred the package to the U.S. Postal Service. Mistake No. 1. USPS transferred my package to Lincoln, Nebraska. Umm. That’s the wrong direction. Mistake No. 2. The USPS folks in Lincoln took one look at the western Kansas address and sent my package east to Omaha. The N on the side of those Nebraska football helmets is for “Knowledge,” you know. Mistake No. 3. 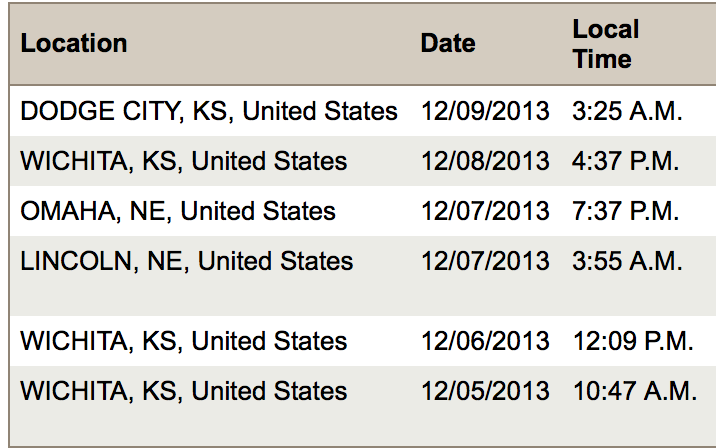 Luckily, the package has now arrived back in Wichita, where it was originally delivered five days ago. There’s a reason the U.S. Postal Service is going out of business, people. And there’s a reason I pay to see the UPS man. But now instead of worrying about the brown truck overturned in the driveway, I have imagined a red flag pops up when a package comes through. I really hope not, though. I’d like to get my orders before St. Patrick’s Day.